This Bobcat was shot, 01/06/2006 at 1:27 PM. It weighted in at 50.5 lbs, one of the largest,if not the largest Shot in Maine. It was Bayed on a Beaver Bog after 3.5 Hrs chase. It measured 38' long and stood over 18' tall. On the left , Guide, Leroy Lane holding "Willey" a reg. Plott. In the center Arthur Withee, Hunter and shooter of Cat, On the right, Guide, Rick Lane, holding "Spike" Also a reg. Plott. Took four Dogs to bay the Cat, One Dog ended up badly hurt, with his rear Flank cut open, He is in the Healing stage now and doing ok. Cat was shot in Hancock County, Maine. Arthur is haveing the Cat fully Mounted. Leroy said he has been Guiding for 35 years and this is the Biggest Cat he has ever seen or got. The Warden that Taged the Cat commented that the Cat was as big as a German Shepard Dog. Guides and Arthur are all from Fairfield Maine. All the papers and Channel Five T.V. have run the Picture and story. Description: This Bobcat was shot, 01/06/2006 at 1:27 PM. It weighted in at 50.5 lbs, one of the largest,if not the largest Shot in Maine. It was Bayed on a Beaver Bog after 3.5 Hrs chase. It measured 38' long and stood over 18' tall. On the left , Guide, Leroy Lane holding "Willey" a reg. Plott. 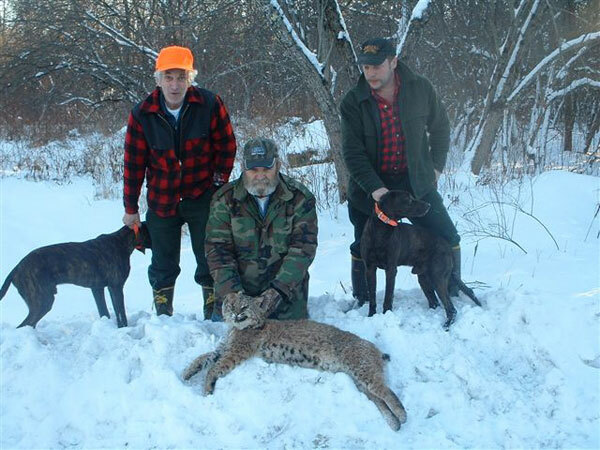 In the center Arthur Withee, Hunter and shooter of Cat, On the right, Guide, Rick Lane, holding "Spike" Also a reg. Plott. Took four Dogs to bay the Cat, One Dog ended up badly hurt, with his rear Flank cut open, He is in the Healing stage now and doing ok. Cat was shot in Hancock County, Maine. Arthur is haveing the Cat fully Mounted. Leroy said he has been Guiding for 35 years and this is the Biggest Cat he has ever seen or got. The Warden that Taged the Cat commented that the Cat was as big as a German Shepard Dog. Guides and Arthur are all from Fairfield Maine. All the papers and Channel Five T.V. have run the Picture and story.